Posted 5/21/2018 2:58pm by Gregg Keckler. Posted 5/18/2018 4:20pm by Gregg Keckler. Posted 5/18/2018 4:16pm by Gregg Keckler. Posted 5/18/2018 4:13pm by Gregg Keckler. Posted 5/16/2018 2:14pm by Gregg Keckler. Posted 5/15/2018 4:42pm by Gregg Keckler. We are pushing to get everything planted. As you are probably aware everything was late because of the extremely cold weather in March and April. Now we are doing spring work and planting at the same time. We may even have green beans to sell before we have peas! We were not sitting idle during those early months. We planted new peach trees and new strawberry plants. We cleaned up some old apple trees and burned the debris and prepared the field for a rest for the year before planting new trees next year. We have been picking salad mix, radishes, and spring onions from the high tunnel as well as mizuna and even a few peas and spinach. Now we are picking onions, spinach and some lettuce from the field. We are seeding the last batch of tomatoes in the green house for planting before July 4. We are also planting winter squash and fall crops in the greenhouse already. The tomatoes, green beans, zucchini, squash, peppers and other small things are already in the ground for summer harvesting. 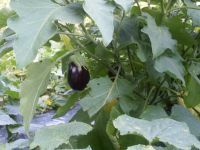 We are hoping to get the eggplant and okra in the ground this week. Markets are starting up for the year. These markets will be starting on June 18. Thanks to all who have signed up this year. We have about 50 shares this year. We are very excited about this number and hope that you will be pleased with the result. Since everyone is picking up at market stands we do not need any logistic discussions for deliveries. GangPlank Marina will be delivered just before Oliver gets to DOT which is on Tuesday morning - probably before 8 am. I will be sending a separate email to folks who are planning to pick up at Woodlake Towers. Juan had a birthday! He is 39! He might be getting older, but he is a spry as ever. He has to be to keep up with Oliver. Gregg and I had another grandchild since we last wrote. Ginny and Dan had a little girl just this week! They are doing well and very happy. They are living in Granville, NY. That is number 16 for us. I think it is time for a break! Gregg can barely remember their names much less their birthdays. Enjoy the lovely spring weather! Our wisteria was in full bloom just last week. It smelled heavenly! The lilacs are just coming out. The blueberry bushes are loaded. The tiniest currants and gooseberries are just starting to appear. The apples are in blossom and plums and cherries have already set fruit. The fruits are just ready to burst out in song! Posted 5/14/2018 3:04pm by Gregg Keckler. Posted 5/14/2018 3:02pm by Gregg Keckler. Posted 5/11/2018 4:40pm by Gregg Keckler.